Soul Star Radio was conceived in 2014 in a dream by psychic medium empath, Jacquelene Close Moore. Live episodes and podcast began airing two weeks later, and the show aired weekly, worldwide, ever since. But, that is not where Jacquelene's media experience began. In the late 1990s Jacquelene presented and managed her first radio show, Quest Radio Show. Jacquelene was approached by and chosen by a USA based internet based natural living radio and television broadcast channel to represent Australian New Age radio on it's global programming schedule. This meant that In 1999, Jacquelene's first radio show was the first ever Australian New Age Radio show to be webcast globally. Two years prior to that Jacquelene had started out on community Radio station 3MDR FM (Mountain District Radio ) when in 1997 Jacquelene was approached out of the blue and invited to appear as a guest onto Quest Radio Show. It would be Jacquelene's first ever media interview, of what eneded up being many. Despite Jacquelene being violently ill with stage fright, shje said yes and for two weeks battled severe nerves until appearing on the show. Jacquelene was to bring with her to the studio - a piece of psychic art she had done personally for the host - having never met them in person ... And, she was to provide a reading for the host - live on air - based off the energy of the psychic art piece. Despite Jacquelene feeling terrified at putting herself and her faith in spirit's message right on the line, live on air, 30 seconds into the start of the appearance and live reading, Jacquelene relaxed and before she knew it the host interrupted with "I will have to stop you right there or people will know way too much about me." The show host continued the interview, and at the end of the show, asked her to come back as a guest again. Jacquelene became a regular guest, then co host, and then finally, when the originator of the show, her co host, moved to television, he left Quest Radio Show to Jacquelene to run as her own. Jacquelene had in that 18 month period gone from shy untrained newbie, to producing and presenting a live show, script writing, producing and acting as voice talent for radio station community announcements and sponsorship adverts, at times acting two to three different characters in 30 second straight takes. Jacquelene also briefly acted as relief station manager, presented a live emergency broadcast during a local bush fire, and was for a time secretary on the board, all important on the job learning. Jacquelene was involved in some of the initial work of her co host's spin off television show, "Pathways," which aired on Channel 31 Melbourne, and while she appeared on air on some of the initial episodes of the television show, Jacquelene kept the radio show going, and went back to it exclusively, feeling much more at ease with a microphone away from cameras, and went on to appear on various television shows for interviews, but not hosting on air television. It was after this Jacquelene was approached to air Quest Radio Show via USA internet, when she became first ever Australian new age radio show to webcast globally, all done from the humble surroundings of a community radio station. After a decade break from running her own solo radio show, Jacquelene began Soul Star Radio in September 2014 feeling it would eventually move to live video but that by the time it would she would be ready. Jacquelene began with a regular co- host, and then broadened to several regulars and a rotation of new guests and solo shows. Soul Star Radio moved to live video broadcasts and podcasts in October 2016, and now Jacquelene also interacts with people commenting on the live feed on the show as well as with callers and those who write in to the show. 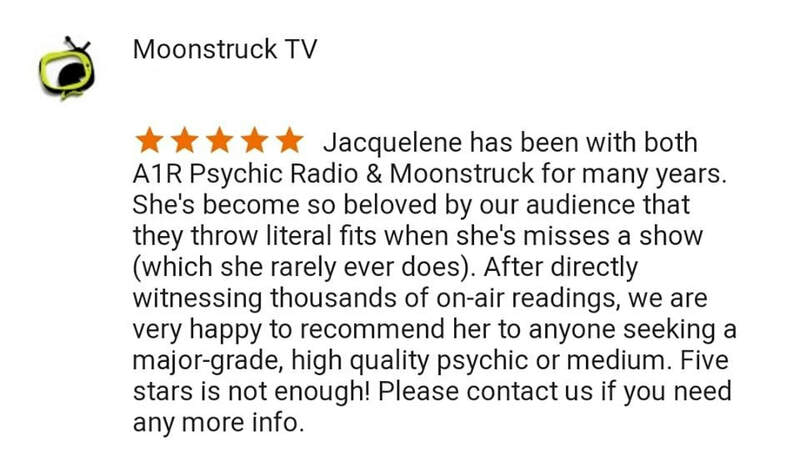 Soul Star Radio with Jacquelene is worldwide, weekly and broadcast live on the A1R Psychic Radio and Moonstruck TV networks, with a growing audience of over 1 million globally. Since 2014 Jacquelene has featured the "who's who" of the Australian psychic and new age / spiritual community and amazing guests including JP Sears, Mitchell Coombes, Ivan Beazleigh from Soul TV, many of the psychics from Psychic TV Australia, as well as as well as international guests including Sue Nicholson from Sensing Murder NZ , Judika Illes, Author, William Stillman author, psychic medium and many, many more. Soul Star Radio as heard on the A1R Psychic Radio Network. The A1r Psychic Radio Network reaches a rapidly growing audience of a million plus.